We do not sell or otherwise share our customers' personal information with any third party. This information is only used for order confirmation, credit card authorization, and key delivery via email ONLY. Your phone number would only be used if your email address fails. Lost Keys can be recovered by logging in to the NewsBin Control Panel. If you no longer use the email address specified when you purchased your key, you will need to update your email address by providing your name, approximate purchase date, and original email address here. If the Shareware License Agreement is violated by using your key on more than 3 machines, or your key is stolen and abused by others, you must buy a new key. If you can prove that all key usages were made by you, exceptions can be made and your key can be reset. Request key reset by sending email to DJI Sales and include a list of known machines (by OS), known IP addresses, and estimate number of uses. Keys will be reset on a case by case basis. Your credit card bill or PayPal account will show a charge from DJI Interprises, LLC or 'NEWSBIN PRODUCTS' for the registration fee or for an Internet Search subscription purchase or renewal. If any charge is disputed, your license to use Newsbin is revoked immediately and a notification is sent to the email address used to purchase the key. If the dispute is in error, the key will be re-enabled after the dispute is dropped and the funds are returned to our account. You may be assessed an additional $25.00 USD dispute processing fee. 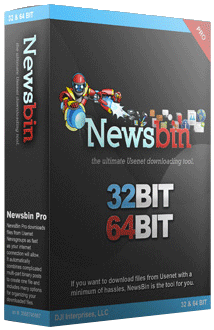 Shareware License Agreement Legal agreement for using NewsBin Professional. If you have questions or need clarifcations on our policies, send mail to DJI Sales.